See a list of all Hasbro Weebles Parts, Pieces, and Figures sold in the sets. 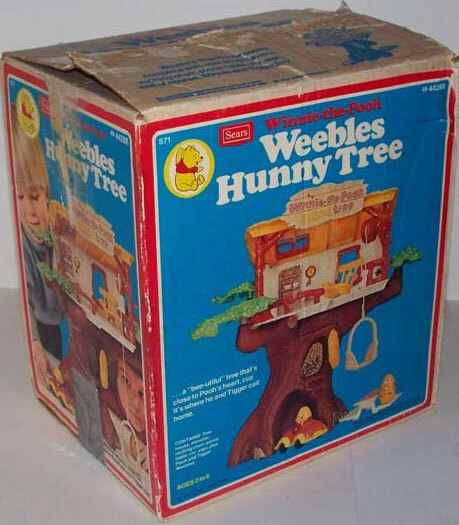 Description: The Winnie-the-Pooh Hunny Tree Weebles set was sold exclusively at Sears in 1975. 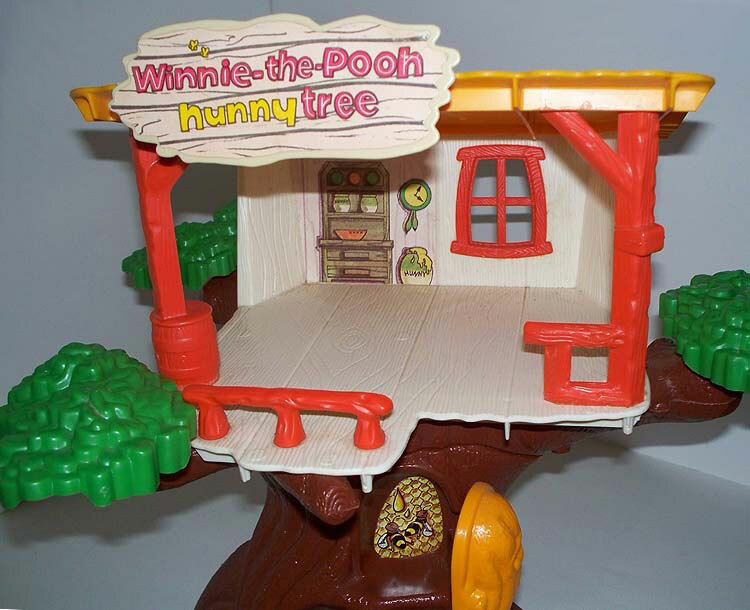 Using the same design as the more common #570 Tree House, the Hunny Tree incorporates the licensed Winnie-the-Pooh characters and theme. Hunny Tree - HTW183 - Brown plastic tree trunk with a 2-level treehouse on top. The treehouse has a white wood-simulated floor and back wall, a yellow roof, and orange support posts. The bottom of the tree base is marked, "©1974 Hasbro Industries, PAWTUCKET, R.I.". Back wall litho - Has a clock, a large honey jar on the floor marked "honey", and a tall wooden cabinet with cars and bowls on the shelves. Small litho with flowers and a mushroom (litho belongs on one bottom side of the base). Small litho of wooden sign (litho belongs on one bottom side of the base). Beehive with bees (litho belongs behind yellow trap door located on the tree base). Door - HTW184 - LIGHT ORANGE wood-simulated door (fits on the front of the tree trunk base). Leaves - 3 each - HTW185 - Green tree "leaves" (attach to branches around the treehouse). Bucket Lift - HTW186 - Orange crane arm (attaches to one front post on the treehouse) with a WHITE "basket" attached via rope. Turn the crane crank to lift and lower the basket. Sign - HTW187 - White plastic sign that attaches to the roof of the Hunny Tree. The sign has a litho on one side marked, "Winnie-the-Pooh hunny tree". HTW188 - White 4-seat picnic table base with 2 molded wood "benches" (2 seats per bench) and 2 upright "arms" between them to hold the removable table top. Measures 3-7/8" long x 2-7/8" wide x 1" tall. HTW189 - White molded wood picnic table top. The top side of the tabletop has a rectangular red/white checkered "tablecloth". Bottom is marked, "©1974 Hasbro®, MADE IN U.S.A.". Measures 3-1/4" tall x 1-1/2" deep x 1/4" wide. HTW190 - Rocking Chair - Light orange low-sitting 1-seat rocking chair with 2 arms and 2 rockers on the bottom. Has a 3-spindle backrest with a rectangular headrest on top. Car - HTW191 - Orange top, yellow base 1-seat car. Has a yellow front and back bumper with raised "tag" in the center, rounded yellow humps over the wheels, and a red body with 2 raised hollow circles "headlights" on the front, and two small raised "taillights" on the back. Rolls on 4 small black wheels. Bottom of car is marked, "©1973 Hasbro®, MADE IN U.S.A.". HTW21 - Winnie-the-Pooh - Orange base, orange top with a red shirt marked "Pooh" on the front. HTW22 - Tigger - Orange base, orange top, orange body with Tigger's face and black tiger marks. Featured in 1975 Sears Christmas Book (page 486) - Price $8.88. Featured in 1977 Sears Christmas Wish Book (page 491) - Price $8.95. Featured in 1979 Sears Christmas Wish Book (page 596). Featured in 1979 Canada Sears Christmas Wish Book (page 176) - Price $10.99. Please, if you have any information or details about this toy that isn't mentioned above then e-mail us. Thanks! Copyright © 1998- This Old Toy. All Rights Reserved. This Old Toy is not affiliated with Mattel/Fisher-Price or any of its subsidiaries.